Sunday 8th April, 2:30 pm at Lisle Carr OvalThis was a big one – first versus second, and it took until the final kick of the game for a winner to be decided. In the end, it was Charlestown who managed to steal victory at the death and maintain their unbeaten run to the season. It’s the best start any side has had to an NPL Northern NSW season – the last time a side won their first four matches in the league was Broadmeadow back in 2012, that saw them claim the championship that year.It was a start which BarTV’s Chris Turner described as ‘reflective of semi-final football’, with both sides much fancied and looking to make a statement. A Rene Ferguson throw-in caught Lambton asleep at the wheel in the 22nd minute and put Scott Smith on his way toward the goal. 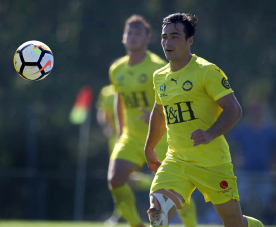 He came 1 on 1 with Brad Swancott and eased it past for his fourth goal of the season.A surging Ben Hay run in the second half levelled things up for Lambton with a little under half an hour to go. Hay was played in by Ryan Griffiths inside his own half, and charged forward, shrugging off some pressure from Ljubo Milicevic and firing home from outside his box to level it up. Just as the match looked to be heading to a draw, a slip from Lambton’s Michael Sessions opened up the space for the Blues’ Masaya Sakamoto.Sakamoto managed to turn it around Brad Swancott for his first goal in Charlestown colours and push his side five points clear at the top of the table.